Our Texas certified appraisers are the top providers of independent residential and commercial real estate appraisals in the Fulshear area. Our goal is to provide a fast, reliable and comprehensive appraisal report that meets our clients’ expectations perfectly. Our appraisal fees are very competitive and we are known for maintaining one of the quickest report completion times in the area. We only employ appraisers that are local to the Houston area and familiar with its varying markets. Our staff is capable of taking on assignments for residential, commercial or mixed-use properties. For commercial jobs we only employ Texas Certified General appraisers with at least 10 years of experience in the Houston market. Additionally, our appraisers can perform valuation services for any use including lending, private matters, insurance, legal concerns and any other scenario that demands an concise and reliable property value. We are devoted to providing competent, courteous and expedient services to all our customers be it homeowners or industry pros. Should you have any questions or you’re ready to order an appraisal, simply call the number on this site or fill out the appraisal order form found above. Getting started takes minutes! 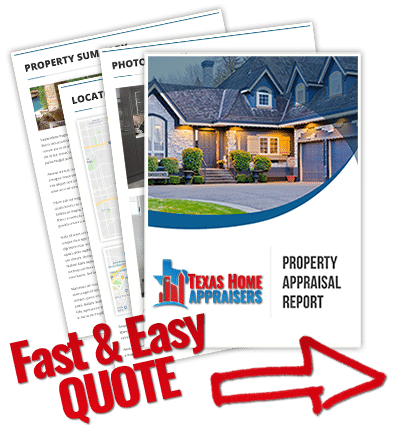 Just submit the web quote request form or phone our number above and one of our residential house appraisers in Houston will be ready to help you with your appraisal. The market or sales comparison approach to an estimate of value is a process of comparing market data, that is, prices paid for similar properties, prices asked by owners, and offers made by prospective purchasers or tenants willing to buy or lease. The appraiser will choose the most similar homes and place them in what is known as the comparison grid portion of the appraisal. There, adjustments are made for differences between comparables and the subject property. The purpose of the market approach is to use comparable sales, adjusted against the subject for differences, to determine a reasonable appraisal value for the subject property. Appraisals are much more comprehensive and consider more data points than a broker price opinion. Unlike a Broker, the appraiser is required by licensing laws to have no interest tied to to sales of a property and their fee cannot be based on the value of the property. Only a state licensed appraiser can provide a certified appraisal. A broker price opinion estimates the value of a property and is performed by a real estate broker or agent. The biggest factor in determining the difference between the two is the motivations for each professional. A broker’s typical goal is to obtain a listing and earn a commission. This could lead to undue influence on the Broker’s opinion based on the desire to gain a client. The appraiser is just interested in completing the assignment and getting paid. The appraisers only other concern is that their report is well researched, reported and received by the client.